In the third quarter of the 19th Century, the Japanese tried a unique experiment using pottery as the base for cloisonne` work. The Seto potters probably started this around 1868, and Kin-kou-san and others soon followed suit. However, this type of cloisonne` can hardly be said to have been successful. For one thing, the pottery base necessitated that the items be fired at low temperatures and therefore very soft enamels had to be used resulting in a matte surface easily scratched and worn. The brilliancy that is one of the beautiful features of Japanese Cloisonne` could not be achieved. Also, the mortality rate was high during manufacture. If the pottery was fired at too hot a temperature, it would crack and thus be useless and all the time spent decorating the item would be lost. 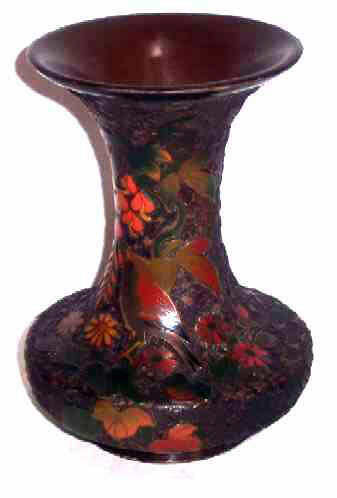 For these reasons, this type of cloisonne` is considered quite rare. It was only made for a short period of time and not much of it remains . . . rather, when it is found it will usually be in private collections or museums. The decoration of this little 6-1/4" vase is exceptional . . . You simply will not find it any better! 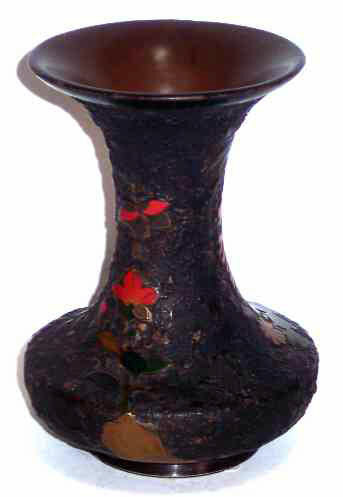 A beautifully done bird with flowering vines and little flowers fill the front of the vase. On the reverse, the decoration is sparser, yet effective in its simplicity. While there has been some interior restoration, it does not affect the integrity of the piece in any way. A rare example for the collector or appreciator of the art of the Orient and the prize of any serious collection.